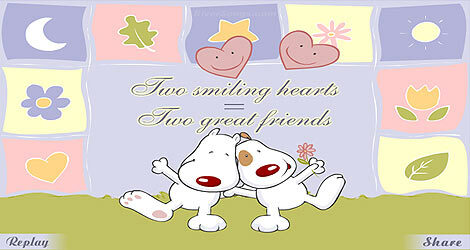 The free best friend greeting cards are made to share with mobiles & computers. This includes iPhone, Android, tablets, iPads & windows phone. Users viewing the mobile best friends cards will typically view a video ecard with music, while computer users will view an animated musical friends ecard. Best Friends day is on the first Sunday of August every year. You may feel free to email up to 5 free best friends greetings in a 24 hour period of time per sending form, should you need to send more free friends cards, or for any other reason, try the alternate mailing envelope near the plus icon of all the best friends greetings. 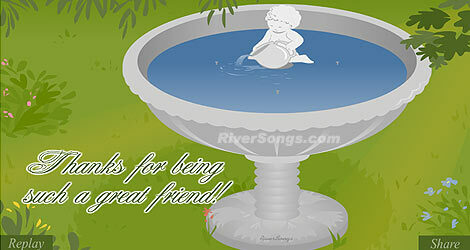 Thank you for using RiverSongs special friends greeting cards, wishes, notes, & letters to touch the hearts of your best friends! We hope your true friends will feel warm & fond wishes that you have kindly expressed for them through our best cards for friends, happy friendship day! Your best friend knows all your stories because they helped you to write them. Great friends are hard to find, even harder to leave, and impossible to forget. Your best friends know that you're not perfect, make plenty of mistakes, know how you really are and love you just the same. A great friend will always be there to pick you up, right after they finish laughing! 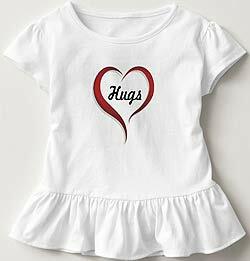 A true friend is someone who seas the pain in your eyes, while everyone else believes the smile on your face. Best friend: The one person in your life that you can get mad at for short periods of time because they love you enough to tell you what you need to hear.